Check out other ASCAP Awards interviews on the site. Dan’s ASCAP interviews include: Elvis Costello, Melissa Etheridge, Jackson Browne, Alicia Keys, Smokey Robinson, Metallica, Green Day, Usher, Clint Eastwood and many others. Both SESAC and BMI continue to depend on Dan for magazine and online content. Check out BMI interviews with Oscar-award winning composer Gustavo Santaolalla, Jenni Rivera and many others at BMI World. Atlanta-based SESAC songwriter Nikeshia Briscoe tells Dan about her first-ever cut, “Womanizer” by Britney Spears at the SESAC website. Now released! It All Begins with the Music: Developing Artists and Careers for the New Music Business, co-authored with legendary A&R executive Don Grierson. Buy it online and at bookstores everywhere. You can now read Dan’s blog and hook up as friends at myspace.com/dankimpel or at facebook.com/dankimpel. 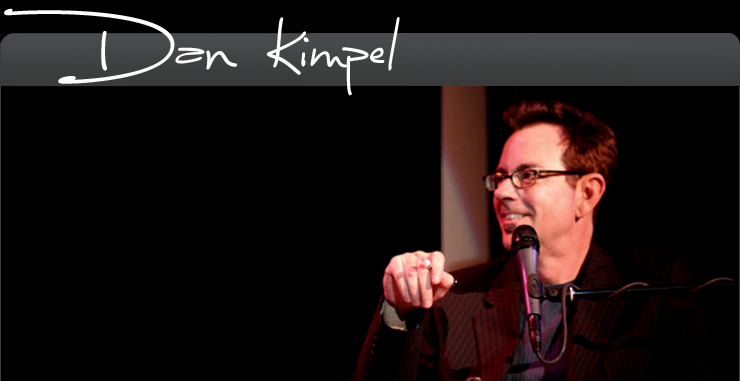 Two videos, one produced by Musicians Institute in Hollywood and the other by consultant Bob Barker, give you a blast of the “Kimpelling” energy on camera! See excerpts from Dan’s Keynote address at the Second Annual SESAC Songwriters Bootcamp. “Song Biz” Dan’s monthly column for the national magazine Music Connection covers songwriting and publishing information from Los Angeles, Atlanta, New York, London and beyond. Each month Dan profiles a songwriter who is making an impact. You can also read Dan’s cover stories and features here. Dan is the featured keynote speaker at Musician’s Institute popular Open House sessions held regularly for prospective students. Music Business Program candidates can currently take two classes with Dan and students school-wide can schedule career counseling sessions with him. Dan has twice been honored as the “MBP Teacher of the Year” by The Institute. You can meet Dan in person at a number of events including the ASCAP “I Create Music EXPO” in Hollywood, the West Coast Songwriters Association Conference in Los Altos, CA, the Sardonyx Music Conference in Pittsburgh, The SESAC Bootcamp in Los Angeles and the Taxi Road Rally where he lectures, moderates panels, gives keynote speeches and yes, even signs books. Kauai Music Festival. Kauai, Hawaii. Musicians Institute Open House. Hollywood, CA. Musicians Institute Graduation. The Wiltern Theater, Los Angeles. Musicians Institute Orientation. Hollywood, CA. TAXI Road Rally. Los Angeles, CA. The Grammy Museum. Los Angeles, CA (presentation for visiting high school students).